"Even if there are a thousand small fights, even if every other minute you’re thinking about suicide, or depression, or addiction, or if you have mental illness, I want people to hit it head on and take action. And to be proud that they’re winning their fight, period." Coincidentally, the campaign launched during the filming of 10.19 The Werther Project, an episode that features suicide as a theme. 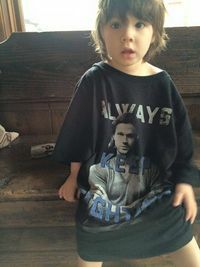 During this first and subsequent t-shirt campaigns, Jared randomly selected a number of fans who had purchased t-shirts and called them or sent gifts such as auto-graphed Supernatural scripts. He also started posting videos about the cause on his facebook page. When sales of the shirt began, a movement started on Twitter and spread across social media, where fans purchased t-shirts for other fans who could not afford them, particularly those struggling with mental health issues. Jared acknowledged that he had heard about these efforts in a tweet (see right source). 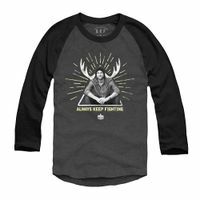 Jared's first campaign sold the most shirts represent ever sold and reportedly raised $250,000 for TWLOHA source. Jared has also spoken openly about his own mental health issues, and inspired many fans to speak of their own struggles and to support each other. In November 2015, Jensen and Jared established The Pack Fund to distribute the funds that they raised. Jared talks to To Write Love On Her Arms about "Always Keep Fighting". 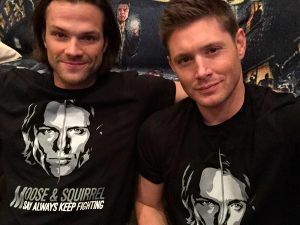 4.2 Jared and Jensen's "Always Keep Fighting Campaign" #2 "Moose and Squirrel"
4.4 "Always Keep Fighting" #4 "SPN Family"
4.6 "Always Keep Fighting" #5 One Year Anniversary "Love Yourself First"
4.7 "Always Keep Fighting" #6 "I Am Enough"
5 "Always Keep Fighting" #7 : Jared & Jensen "Family Has Your Back"
During the first t-shirt campaign Jared posted about The Story Behind the shirt and "Always Keep Fighting"
On New Years Eve, my dear friend lost his battle with depression. This, unfortunately, wasn’t the first time i lost a personal friend to suicide, and it hurt me deeply, in a way that only a personal experience with suicide can. Though he wasn't the first friend I’ve lost to suicide, I sure hope he’s the last. I wish i had the chance to go back and tell them what they meant to me. I wish I had the chance to beg them to seek help, to keep fighting. I wish they knew that they were surrounded by countless others who struggle on a daily basis. I hope that this campaign, while raising money for a wonderful charity, can also raise awareness about issues that affect more people than we know. I hope it inspires people battling depression, addiction, mental illness and suicidal thoughts to be vocal about their struggles. I hope it helps people realize that they shouldn’t be ashamed of what they are going through, and I hope it helps people meet and find new friends that they can relate to. I hope it helps people take pride in the fight that they have been fighting, and gives them a push to never give up or give in. I hope it helps inspire people to keep fighting. no matter how hard it is. For people who deal with mental illness, depression, addiction or suicidal thoughts, every day can bring about new struggles. Every hour and every minute can seem to bring insurmountable odds of happiness. 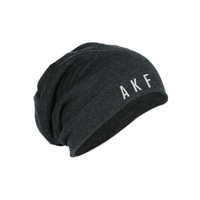 I hope that the simple message of “always keep fighting” can help to bolster somebody through a tough time. I also hope this campaign can help alleviate some of the stigma that the terms “mental illness” and “depression” sometimes evokes. Everybody has either dealt with these issues themselves, or had a loved one who deal with them. It’s time for us to put these issues front and center and not be ashamed of the path we are walking. If you’re out there and need help, please seek it. Be proud of your valiant day-to-day struggle. There is no shame in needing support. I hope this campaign will help you be vocal about your own struggles, or vocal in your support of those who might need a helping hand. Most of all, when life seems to want to beat you down, I hope you Always Keep Fighting. Jared talks about his own struggles with depression and anxiety, and why he started the campaign by Variety. so… we wanted to take a little time to let you guys know what we’ve been planning over the last couple weeks :). 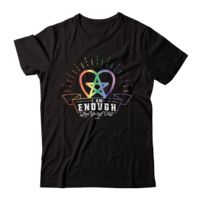 here goes… with the crazy success of the #SPNFamily, and #AlwaysKeepFighting campaigns, we’ve seen FIRST-HAND the kinds of amazing things that can be accomplished when we all work together to support causes that are important and meaningful to us all. With y'all's help, we’ve been able to raise (literally!) hundreds of thousands of dollars to support great organizations. Organizations like To Write Love On Her Arms, Wounded Warriors, St. Jude’s, Attitudes In Reverse, The Down Syndrome Connection, and more. Beyond the financial benefits to these charities (and, in our opinions, even MORE IMPORTANTLY), we’ve also been able to start conversations about issues that have, up to now, been so heavily stigmatized by those who don’t understand, that they were often just avoided outright or hidden. We, as a group, have been able to offer support and love to people who we have never had the pleasure of meeting face-to-face. Take it from two guys who flip through their comment sections every now and again, YOU ARE HELPING COUNTLESS OTHERS! The causes we’ve been able to support so far are fantastic and deserving. We can't wait to continue to work with them in the future. Wonderfully, our eyes have been opened to lots of other charities and causes that might need a helping hand to grow, or may not have even been started yet! With that in mind, and with the understanding that there are SO MANY great organizations out there that could use a little push, we (Jensen and Jared, Dean and Sam, Squirrel and Moose, Jason and Dean [for you Smallville and Gilmore Girls fans], you get the idea) have decided to start a fund to support a variety of causes, now and in the future, that can help make the world as we know it a better place. We have a close friend (though much older than we) that "Randomly" performs certain "Acts" that change the world, and people's lives, for the better. It's been an inspiration, and we thought, we should do that too! We have the "bug". We want to seek out and find MORE worthy causes (while still supporting the aforementioned charities, of course) so that there can be an overwhelming abundance of places people can go to seek help. Whether it's for mental illness, depression, addiction, or for causes that we are not even aware of yet! In addition to the fund that we have started, we are ALSO going to work with that guy named Misha Collins (maybe you've heard of him) and his wonderful charity "Random Acts" to increase our reach and accomplish things that we simply could not accomplish alone. We've learned, after all these years, that things are better when we're all working together. Making the world a better place :). I can't thank y'all enough for the immense love, support and enthusiasm you've shown for what we're trying to do here. 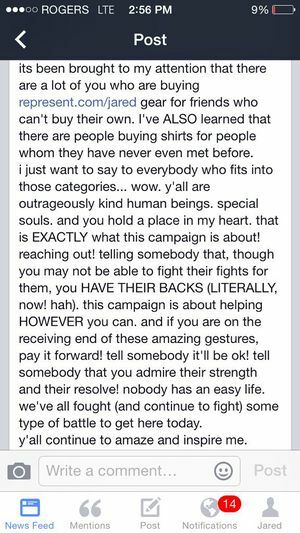 Even those who can't afford a shirt have played a big role in this campaign just by sharing their inspiring stories and spreading love, care and understanding throughout this incredible community / movement / family we've all created. You guys never cease to amaze me. On 15th May, Jared has announced that he was heading home from Europe and wouldn't be attending Jus In Bello Italy 2015, and asked for support from the fandom. , . Many of Jared's colleagues and friends, as well as fans, posted messages of support. You can read some of them here source. At the Convention Jensen reported that Jared was physically and emotionally exhausted, and was now home with his family. "Jared wanted everyone to know he loves meeting his fans around the world and was very upset at having to cancel his trips to Rome and Australia. Jared has pushed himself to his limits and is suffering from exhaustion. His SPN family is so important to him, and he asks that they Always Keep Fighting. At this time he needs to be home with his family. He's doing better already and is excited about shooting Supernatural season 11 this July. For now he's taking a break, but is so appreciative of his fans, and sees and feels their love and support." On 18th May, Jared tweeted "Thank you, from the bottom of my heart and soul, for your love and support. It's going to good use. All of my love and #AlwaysKeepFighting." Jensen talked about Jared at All Hell Breaks Loose 5 Sydney/Melbourne 2015. Listen to it here. 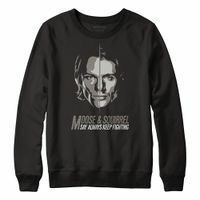 Jared and Jensen's "Always Keep Fighting Campaign" #2 "Moose and Squirrel"
Number Sold: 70,121 (58,195 in original launch) t-shirts. 2,510 phone cases and 526 kid's t-shirts sold. 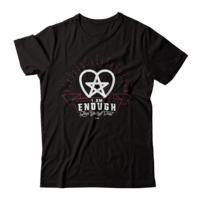 Charity: A portion of proceeds goes to a joint fund set up by Jared & Jensen, and various causes promoting mental health awareness. "Always Keep Fighting" #4 "SPN Family"
Charity: A portion of proceeds goes to The Pack Fund a joint fund set up by Jared & Jensen, and various causes promoting mental health awareness. 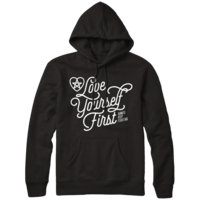 "Always Keep Fighting" #5 One Year Anniversary "Love Yourself First"
On Sale: March 2016 Hoodies, t-shirts, 3/4-sleeve shirts, sweatshirts, and tank tops, some styles offered in black, gray, navy, royal blue, and purple. 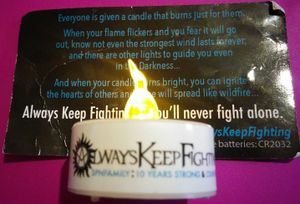 "Always Keep Fighting" #6 "I Am Enough"
"Always Keep Fighting" #7 : Jared & Jensen "Family Has Your Back"
Charity: "Charities that fight against depression, self harm and suicide." "It's been 12 years of nonstop excitement and thrilling adventure with Jared Padalecki and Jensen Ackles. Whether you've rooted for them on screen or off, the two friends have been keen supporters of each other's work with the Always Keep Fighting, Love Yourself First and I Am Enough campaigns. 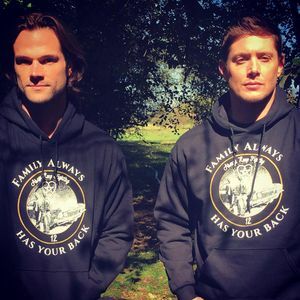 Help these two celebrate 12 years of family with this limited edition Jared & Jensen, "Family Always Has Your Back" campaign. 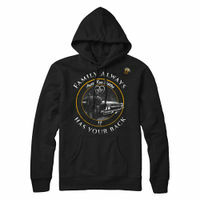 "COMMEMORATIVE BUTTON PIN EXCLUSIVELY ACCOMPANIES EVERY PULLOVER HOODIE PURCHASE TO HONOR 12 YEARS OF FAMILY! "IF YOU MISSED THE FACEBOOK LIVE EVENT WITH JARED AND JENSEN WATCH IT BELOW!" Everyone is given a candle that burns just for them. Always Keep Fighting, & you'll never fight alone. 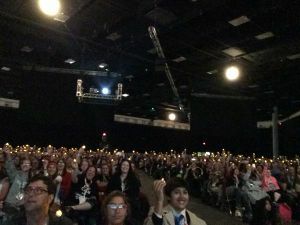 Anne distributed the 1185 of the tea lights to Supernatural fans as they queued for the Supernatural panel in hall H on the morning of Sunday 12th July, 2015 (the remaining tealights were given to the panellists, absent friends. one went to William Shatner, on whom GISHWHES team Ann had been). Following the main panel, as the audience questions began, the tealights were turned on and held high in the audience. A note and tealight was passed to Jared on stage, who was visibly moved by the display. The action garnered wide media coverage. To anybody and everybody that had ANY part whatsoever in the Always Keep Fighting Hall H tea light event. I feel so blessed, and grateful, and honored to be a part of the magical Supernatural Family. 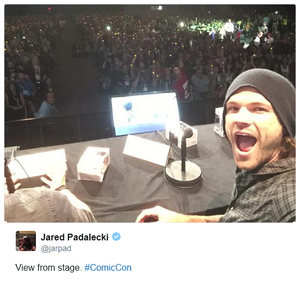 Sitting on that stage in Hall H, I initially mistook all of the lights for cell phone cameras. It's difficult to discern specific shapes and faces with all of those stage lights shining on you (and, it's quite intimidating up there, sitting in front of 6,500 people!!). Then, when I had a light given to me with an explanation of what it was and what it stood for, I was (and am still) gob-smacked. From the very bottom of my heart and my soul, thank you so much. I will never forget this day. I will never forget the love that I felt, and still feel. And, to everybody who held a light for me, please know that I hold my light for you. Though I happened to be the one sitting on stage, I am but one small light in a see of thousands. TOGETHER, we can and will make a difference! Keep letting your light shine. I will do the same. 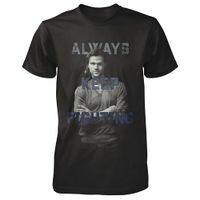 In addition to buying t-shirts for fellow fans, a number of other fan campaigns have been inspired by "Always Keep Fighting". Some fans made items such as "Always Keep Fighting bracelets or t-shirts, and donated proceeds to organizations such as To Write Love On Her Arms. The site Carry On SPN started a message board where fans could share their stories about their mental health. Read it here. At Salute to Supernatural New Jersey 2015, @TONiANN_ROSE and @AttitudesInRev organised for the audience to wave "Always keep Fighting" glowsticks which they waved at the beginning of the J2 panel. The sticks were accompanied by a card which read in part "It's okay to be a glowstick; sometimes we need to break before we shine". @TONiANN_ROSE also raised $1,500 for Attitudes in Reverse. "We are well aware of the importance of this issue and the great work the series’ stars have done in this area but we feel it is not in the best interests of the conventions to over burden our celebrities with so many difficult and heart wrenching stories focused at an event that is meant to be fun for them and the audience. We are asking as some of the celebrities have, that your personal stories be posted to their Facebook pages where they can read them in moderation and at a time when they are not dealing with long lines of other folks." 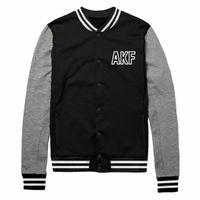 This was presumed to be prompted by the fans helped by the #AKF campaign relating their stories during conventions. One fan reported seeing Jared need to take a moment to compose himself after speaking to a fan during the autograph session source. Jared talks to "To Write Love On Her Arms"
Jared talks about his own anxiety and depression with Eonline. This page was last edited on 23 March 2018, at 11:18.